Mish's Global Economic Trend Analysis: Productivity Remains Weak; Spotlight on Retail Store and Trucking; Are Productivity Measurements Accurate? Productivity Remains Weak; Spotlight on Retail Store and Trucking; Are Productivity Measurements Accurate? Economists expected bounce in productivity, and got one, but it was a bit weaker than than the Bloomberg Consensus Estimate of 1.6%. A bounce back for output gave first-quarter productivity a lift, up a quarter-to-quarter 1.3 percent vs a revised decline of 1.1 percent in the first quarter. 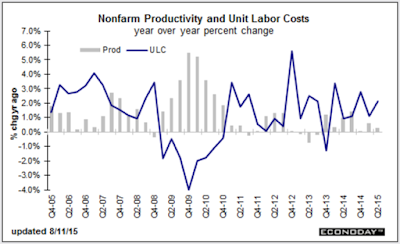 The bounce in output also held down unit labor costs which rose 0.5 percent vs 2.3 percent in the first quarter. Output in the second quarter rose 2.8 percent vs a depressed 0.5 percent in the first quarter. Compensation rose 1.8 percent, up from 1.1 percent in the first quarter, while hours worked were little changed, up 1.5 percent vs 1.6 in the first quarter. Looking at year-on-year rates, growth in productivity is very slight at only plus 0.3 percent while costs do show some pressure, up 2.1 percent in a reading, along with the rise in compensation, that will be welcome by Federal Reserve officials who are hoping that gains in wages will help offset weakness in commodity costs and help give inflation a needed boost. The dry spell of productivity in this economic expansion is even worse than previously thought, according to new data released Tuesday. The average annual rate of productivity growth from 2007 to 2014 was revised down to 1.3% per year from the prior estimate of 1.4%, the Labor Department said Tuesday. This is well below the long-term rate of 2.2% per year from 1947 to 2014. 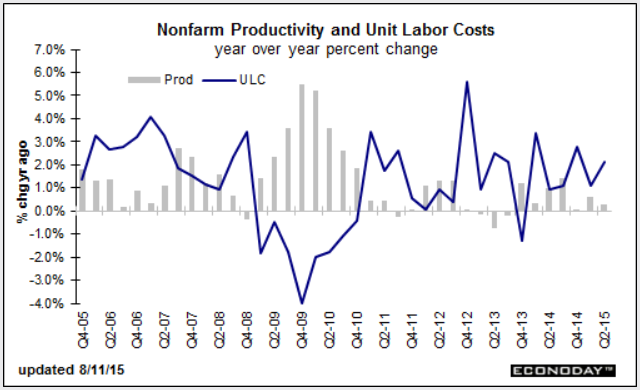 Productivity in 2013 was especially weak, revised down to unchanged from the prior estimate of a 0.9% gain. Productivity even dipped below zero for three quarters in 2013. That hadn’t been seen since 1982. Former Fed chairman Alan Greenspan said Monday that weak productivity is the most serious problem that confronts the U.S.
Federal Reserve Chairwoman Janet Yellen has also called productivity since the recession “disappointing,” even before the downward revisions. The flipside of the weakness in productivity growth is that it is one reason for the Fed may be eager to get starting raising interest rates in September because weaker productivity lowers potential growth and it doesn’t not take much to generate inflation. There is widespread debate among economists about the causes of weak productivity. Some blame the lack of capital investment. Some question the government’s measuring skills. Joel Naroff, president of Naroff Economic Advisors, said productivity is low because workers have learned that in this expansion working harder doesn’t get them anything in return. “If firms want to drive up productivity, they will have to do it the old fashioned way, by providing incentives to work harder,” Naroff said. Workers Learn Not to Work Hard? The above comments on productivity are incredibly funny. The most ridiculous notion is the Fed will hike because low productivity means higher inflation. Good grief. The Fed wants higher inflation. And inflation (as measured by the CPI) has consistently been under the Fed's 2% target. Of course the CPI measurement is a piss poor measure of inflation in the first place, but it is what the econo-clowns at the Fed believe in. And what about notion "workers learn not to work hard"? That seems ridiculous as well. What if the workers simply are not any good, or are good and cannot get much better? Have retail stores expanded so much that companies have to hire marginal workers just to staff them? How many in retail have totally useless college degrees and a lack of real skills? What skills are even needed to take an order for a burger, or scan an item at the register? That question we can answer: almost none. Productivity would go up if a scanner could ring up an entire basket at one, and the person behind the register was made redundant. On June 21, I noted the Most Common Job in 29 States is Trucking. 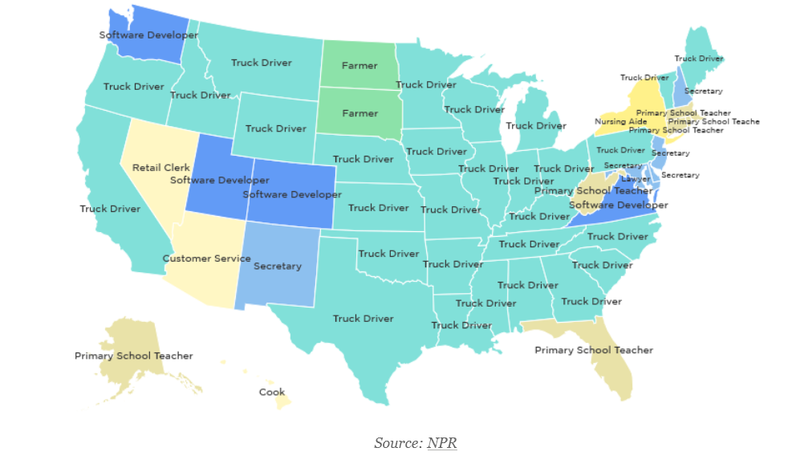 The NPR claims the most common job in 29 of 50 US states is truck driving. This seems a bit overboard, and depends on how jobs are categorized, but here is the chart. As with retail, short of automating trucks and firing truckers, there is scant room for increased productivity. Software mapping of the best routes is not likely to get much better. When trucks are fully automated, productivity will soar, but the industry will lose millions of jobs. Many question the measurements. So do I. But which way do they go? Up or down? With so many working in retail and trucking, until masses of people are fired, productivity just may stagnate. Alan Greenspan said Monday that weak productivity is the most serious problem that confronts the U.S.
For that blame the Fed. One can also blame the Fed for its loosey-goosey monetary policy and nonsensical 2% inflation target. Increases in productivity are inherently price-deflationary: More goods produced quicker should result in falling prices as well as higher standards of living. That's a good thing. But the Fed does not want falling prices. It wants unit labor costs to rise. The catch is the higher the unit costs, the more incentive there is to get rid of workers. The Fed just may not want the next major advancement in productivity because of what it will do to jobs and prices. But that is just around the corner led by fully automated trucks, buses, and cabs.